The world rocks and rolls into 2009 in just over an hour as we watch our Jonestown Turns Thirty year officially sink into oblivion. One of the most ironic things about self-appointed "prophet" Jim Jones was that painfully prophetic sign hanging over his jungle kingdom's throne, bearing Santanya's warning that "those who do not remember the past are condemned to repeat it." 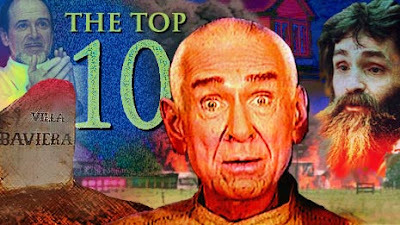 Consider carefully the cult carnage of the Branch Davidians, Solar Temple, Heaven's Gate, and the Movement for the Restoration of the Ten Commandments of God. All were a senseless slaughter like that madman's "revolutionary suicide," all a hideous byproduct of brainwashing and coercion. All taking place in the years after the Guyana holocaust. Grim oracle indeed. How many more will we witness? Moreover, how much longer will cults, if not committing outright murder, continue exploiting, brutalizing, and destroying lives? That really depends on the direction of the raging battle by present-day cults and their apologist brigades for today's hearts and minds gullible enough to fall for the dangerous false advertising of "New Religious Movements (NRM)." Such a perky little euphemism, don't ya think? Throw it onto the rest of the pile, along with so many well-used ones. My favorites include some of the military gems, "pacification," "ethnic cleansing," and "enhanced interrogation techniques." The last one, in fact, is real close to home, isn't it? But George Bush's torture tag teams have to share some credit. 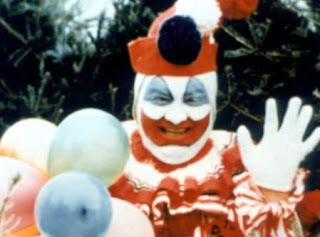 Our Jonestown "pioneers" -- as Becky Moore likes to call them -- had their own special little waterboarding parties just for uncooperative kids, in a quaint ritual called "Big Foot," where terrified children were repeatedly dunked at the bottom of a dark well. 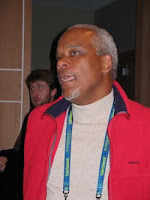 On the other hand, film maker Stanley Nelson told the world: "I see them in Jonestown and part of me sees a huge party, you know what I mean?....They can party as hard as they want. All the people are there, everybody that you know and love, you can go put the kids to bed, and they're safe in their beds..."
Ah, so then perhaps the children were treated to the Temple Waterboard Ride around lunchtime, Stan? What we can almost certainly count on in 2009 and beyond is more of the same dol ing out by cult aplogist hordes of generous servings of thought-crushing cliches and propaganda pyrotechnics. Sometimes even the most noxious cultists such as Lafayette Ronnie Hubbard's science fictionologist flakes manage to have a rampaging Tom Cruise be their featured act on a leash. Recently I heard from reader, Alan Havlick, who shared the frustration of having to deal with an especially twisted cultist in Texas, Doyle Davidson, who's been menacing the public from the airwaves. "I had to open my own website and expose him. We have removed him from every TV station but one and now no one can search his name without also seeing the truth about him at my site. But I am still amazed by the people who continue to follow him -- they have been to my website and seen the truth. Several ex-members post there and confirm the truth, yet they refuse to get out. 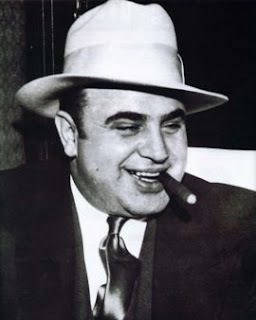 "I think you're right about his (Jim Jones) adopted son; he is hanging around with the wrong people. 'Villainized'?? Get real, Jones, Jr.
"Again, I say: 'Get real.'" Below is a sampling of the "Water of Life" ministries Grand Guru Doyle, warmly embracing a sinful follower, in a room that appears populated with department store mannequins. Davidson, besides bedding down with a married member of his flock (and going bonkers when she finally returned to her spouse & children), also equates modern medicine with "witchcraft." 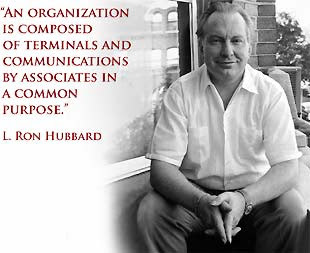 Scientologists, you got a friend. Speaking of friends, not all my readers are quite as agreeable as Alan is. "Joanne" (no last name) takes a psychoanalytical, if not just plain heated viewpoint. "I can't help but look," she wrote, "at all these different websites and filmakers and make a spectrum. Rebecca Moore and Mac all the way to the left....you all the way to the right. I don't understand why you can't wrap your head around the similarities you have with Moore and McGhee. You are obviously warped by your father's experience. You can't see past what information you get from that. Rebecca is obviously warped by her family's experience. "To me you are so filled with hate, rage, and self righteousness, I can't read any more of your blogs. You are the equivalent of a four year-old having a temper tantrum..."
Sometimes I never know when it's one of Mac or Becky's pals writing in, so I'll just have to give my critic Joanne the benefit of the doubt. I will say this, as I've said before: I do not hate Becky or Mac. What I hate is what they're doing. Because cult apologist promotion is WRONG. It's unethical. It's outright dishonest. They have been dishonest and I have proof. Yes, it does make me feel enraged to know that the imprisonment, abuse, and mass murder of over 900 Americans was entirely preventable, Joanne. PREVENTABLE. That doesn't seem to make any more difference to you than trying to grasp the social psychological dynamics of thought control. Meet Frankie Fountain (L), David Sanders (R), and Jewel Fountain (above). 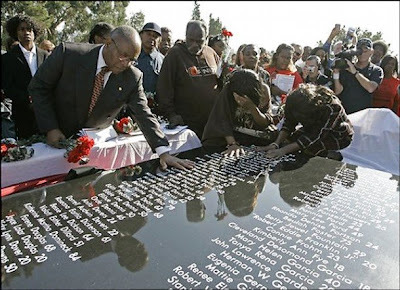 Two brothers and a sister that helped make up the nearly 300 children slaughtered by Jim Jones. 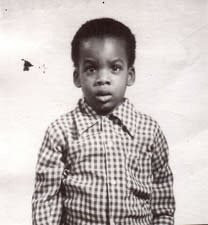 Frankie was five years old, David, nine, and Jewel, well, this little girl was all of four years old when she was murdered by selected Temple mass murderers. You ever wonder if or how many times they got beaten up, abused, or receive that horrifically cruel cult water torture? 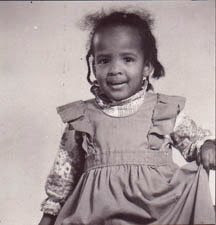 Four year-old Jewel. Maybe she had a temper tantrum when they held her down and forced cyanide down her throat. Say hello to Dr. Lawrence Schacht (top), Annie Moore (L), and Carolyn Moore (R). Top-ranking Jonestown death camp executioners who, after their unspeakable crimes, took their own lives. Becky referred to this as "poetic justice." Wondrously convenient things, these euphemisms. And from the throngs that crowd life's lanes I have selected you. I fancied that I heard them say, "Dear Lord, Thy will be done." For all the joy Thy child shall bring, the risk of grief we'll run. We'll brave the bitter grief that comes and try to understand." "Thirty years ago," says CNN, "900 people died by murder and suicide. Only a few survived. 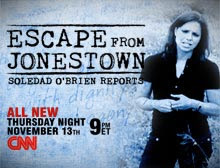 Now, CNN special correspondent Soledad O'Brien reports on their untold stories...."
In its special report that originally aired last Thursday--five days before we observe the anniversary of that horrific day--CNN did a fine job interviewing former cult members who miraculously survived the slaughter. 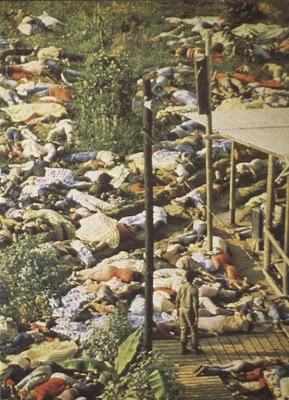 They told the truth about life in Jonestown, in all its graphic, shocking details. in his rise to power were to step forward with one massive, long-overdue apology (in the style of Robert MacNamera's Vietnam mea culpa) AND media behemoths like the San Francisco Examiner & Chronicle admitted they could have stopped Jones's cult assassins LONG before November 18, 1978? Maybe this could be made into a song. Call it "Imagine II." Much less sanguine than the first. As it is, the Chronicle's series, "Ten Days That Shook S.F.," kicked off yesterday, bringing on an added dimension to the world of media whitewash. Imagine (sorry, the thought keeps poppin' up) the public's reaction if the Chronicle revealed how their "Institution", the late, great columnist Herb Caen, had been in virtual cahoots with Jim Jones. 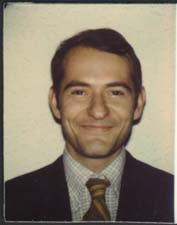 Caen did all kinds of shimmering plugs for the cult; just a little over a year before the November, 1978 mass murder, Caen claimed Jones was the "target of a ceaseless media barrage" and was actually "doing the work of the Lord" in Guyana. Don't worry folks, the secret's safe. Current Chronicle editor-in-chief Phil Bronstein would no more disclose this on his pages than he would discuss the shameless behavior of his former employer, the S.F. Examiner. The Examiner, of course, had been bullied by Jones's attack dog attorney, Tim Stoen, to shelve half of my father's 1972 Temple exposes, even after he had returned from Ukiah with taped sworn statements and signed affidavits from members of the Concerned Citizens who were facing down--unlike the Chronicle & Examiner--the cult terror all around them. That brings us to yet another exceedingly dishonest voice that has already been telling his Anniversary Historic Fiction Story over the Associated Press network: Mr. Tim Reiterman. 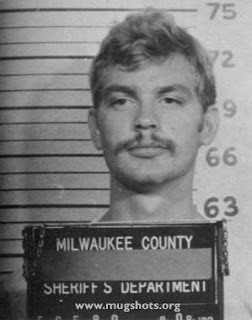 Ol' Tim, as I have said, was unquestionably brave in going down there to Jonestown with the Ryan party, and nearly got killed on that airstrip. Still, this can't excuse his lying about investigative reporter Les Kinsolving, loaded down with sworn statements and affidavits fresh from Ukiah, and falsely accusing him of having exposes "not well substantiated." Clearly our "Raven" star author was angling for some insurance that it would be REITERMAN that would stay bathed in limelights, despite the fact that he, like Chronicle reporter Marshall Kilduff and all the rest, did NOTHING for all those years leading up to 1977. NOTHING to lift a hand to write a critical word about this dangerous cult leader. NOTHING to try and save all those people trapped in a madman's crushing iron grip. Better late than never?? Not this time. That's the truly phenomenal thing about this People's Temple Saga. 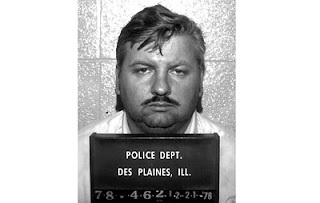 Like the astoundingly evil Indiana con man that gave birth to this frightful cult, so also came a school of relentless bottom feeders. 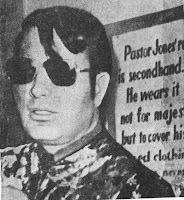 Be they ruthless opportunists or gutless appeasers, their sordid behavior was the ultimate key to Jim Jones's breath-taking success before The Fall. "We are pleased and honored that you will be with us...to accept Glide's 4th Annual Martin Luther King Jr. Humanitarian Award", Williams wrote to Jones, in January, 1977, "in recognition of your leadership to many communities of people." social works," said the publisher of the San Francisco Chronicle, "which include housing and feeding senior citizens and medical convalescents, maintaining a home for retarded boys, rehabilitating youthful drug users. 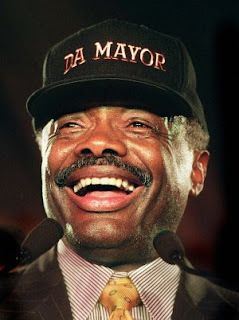 . ."
But of all of Jim Jones's benefactors, none could dare hold a candle to flamboyant, dynamic, and dapper local politician, Willie Brown. 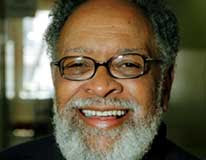 "When somebody like Jim Jones comes on the scene," said Brown, in July, 1977, just after the New West expose hit the streets, "...and constantly stresses the need for freedom of speech and equal justice under law for all people, that absolutely scares the hell out of most everybody...I will be here when you are under attack, because what you are about is what the whole system ought to be about!" Thus, a cornucopia of local celebrities......all of them did their part to make the truly avoidable massacre......unavoidable. For all the agonizing questions regarding the "hows" and "whys" of such a thing like this happening, one need only look deep into the face of the social psychology dynamic working in tandem with the primeval acts of unscrupulous power brokers. "Did the government officials believe Jones or did they think he was a non-violent quack they could use for political gain? What happens to peoples brains when people like Jones or Hitler or a screaming Drill Sargent keep on screaming at them? "Is there something hard-wired in children (and adult dumb f----) that when someone screams at them long enough, they will do what they say, and believe anything, because the ones who didn't believe and do what the group did, were taken out of the gene pool....?" Excellent, relevant questions. One of the best resources available for such inquiry is the renowned Stanford social psychology scholar, Prof. Philip Zimbardo. Zimbardo, whose famed 1971 Stanford Prison Experiment set a standard in gauging the capacity for cruelty, recently authored, "The Lucifer Effect: Understanding How Good People Turn Evil." Judging from the reviews, including these kudos from author Gail Sheehy, there seems little doubt about this book offering some solid insight. "Stunning!" says the 'Passages' author. "Drawing on a lifetime of brilliant social psychological research, Zimbardo demonstrates how good people can be transformed into 'evil doers' by the power of situation--even you! He decodes how the Bush administration, in the delusion it alone can rid the world of the evil of terrorism, has turned into a model of 'administrative evil.' But Zimbardo also offers us a vision of how we can challenge an unjust system." A number of sections in Zimbardo's book ultimately had to be deleted for lack of space. One of them was entitled (and can be found on the book's website): "Killing Your Children on Command: Ultimate Demonstration of Situational Power by Reverend Jim Jones"
It is enthralling, to say the least. "Our final extension of the social psychology of evil from artificial laboratory experiments to real-world contexts comes from the jungles of Guyana, where a very popular American religious leader persuaded more than 900 of his followers to commit mass suicide or be killed by their relatives and friends on November 18, 1978. 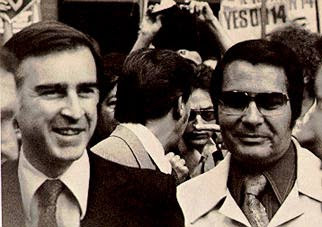 "Jim Jones, pastor of Peoples Temple congregations in San Francisco and Los Angeles, set out to create a Socialist utopia in South America where brotherhood and tolerance would be dominant over the materialism and racism he loathed in the United States. But Jones was transformed over time and place from the caring, spiritual 'Father' of this large Protestant congregation into the Angel of Death--a truly cosmic transformation of Luciferian proportions. For now, I want only to establish the obedience link between Milgram’s basement laboratory in New Haven and the jungle killing-field in Guyana. "The dream of the many poor members of Peoples Temple for a new and better life in Utopia were demolished as soon as Jones instituted forced extended labor, armed guards, the total restriction of all civil liberties, semi-starvation diets, and daily punishments for the slightest breach of any of his many rules that amounted to torture. "When concerned relatives forced a Congressman and his media crew to inspect the compound, Jones arranged for them to be murdered. He then gathered almost all of those members who were at the compound and gave a speech that lasted less than an hour in which he exhorted them all to take their lives by drinking cyanide-laced Kool Aid. Those who refused were forced to drink by the guards or were shot trying to escape, but most obeyed their leader. "And they did; they died for 'Dad.' The power of charismatic tyrannical leaders, like Jim Jones and Adolph Hitler, endures long after their deaths, even though they have done terrible things to their followers. Whatever little good they may have done earlier, however, somehow comes to dominate their legacy in the minds of the faithful. "Consider the example of a young man, Garry Scott, who followed his father into The Peoples Temple but was expelled for being disobedient. 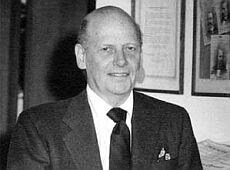 Listen to his brief statement as he called the National Call-that followed the broadcast of the NPR show, 'Father Cares: The Last of Jonestown,' by James Reston, Jr. Listen to how he was punished for an infraction of the rules. But more importantly, listen to his articulation of his enduring reaction to this torment. "Does he hate Jim Jones? Not one bit. He has become a 'True Believer,' a 'Faithful Follower.' 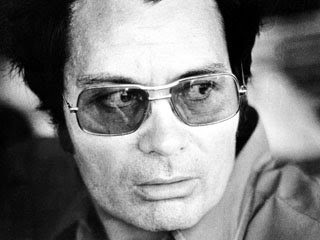 Even though his father died of poisoning in Jonestown and he himself was brutally tortured and humiliated, Gary still admires and loves his 'Dad'--Jim Jones. Not even George Orwell’s omnipotent 1984 Party could honestly claim such a victory. "Gary: 'Like a lot of other young people, I had my sort of rebellion against some of the doctrinal methods that were taking place in the church, and I rebelled, and for that I was punished to become a better Christian. 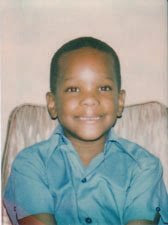 I was physically abused. Beaten with a two-by-four. I was whipped. "Moderator Bill Moyers then asked: “What did you see in Jim Jones when you were in the Temple that caused you to be faithful despite your treatment? "Gary: 'I think the guilt. I felt that I was responsible for everything that was taking place around me. If there was any bad attitudes or any bad feelings emitting from persons in the Temple, I felt that they were my actions.... I followed Jim Jones because he was a very caring person. 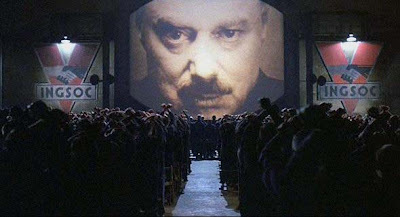 "Like Orwell's protagonist, Winston Smith, Gary Scott seems 'to have won a victory over himself. 'In the end, they love Big Brother and Father Jones, alike. Powerful Authority Systems conquer individual personality systems more often than does the reverse." I'll have to take issue, however, with his statement that "most obeyed their leader" in taking their lives. 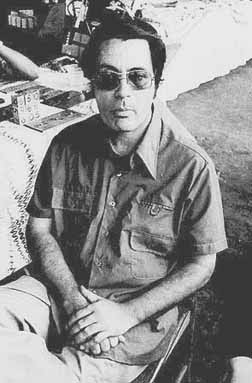 Guyanese Chief Coroner Leslie Mootoo examined the corpses at Jonestown and discovered that up to 90 percent of the victims had been injected with the cynanide, shot, or strangled. In the final analysis, over 900 plus Americans were simply coerced, brainwashed, and enslaved. 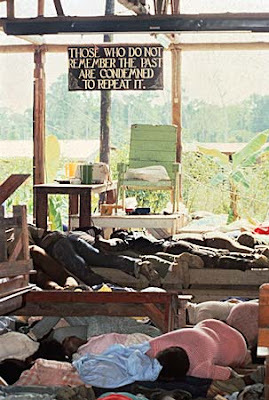 One Jonestown visitor said it resembled a southern antebellum slave plantation, with "Dad" Jones acting the part of the white master, surrounded by his lily-white planning commission crew serving as the overseers, carrying out Marxist Master Jones's crazed orders. In the end, of course, Temple planning commissioners cold-bloodedly murdered nearly every one in sight. 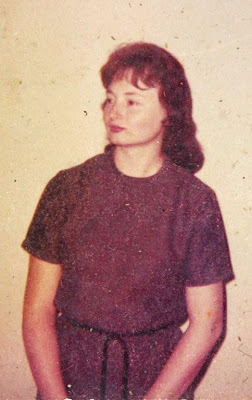 One of these killers, Becky Moore's own sister Annie, left a final note that corroborates how she, as Gary Scot and Orwell's Winston Smith, had won a victory over herself. For Annie Moore, this meant simply surrendering to a "Big Brother" named Jones. 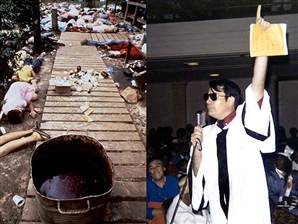 "Where can I begin — JONESTOWN — the most peaceful, loving community that ever existed,' wrote Annie, 'JIM JONES — the one who made this paradise possible — much to the contrary of the lies stated about Jim Jones being a power-hungry sadistic, mean person who thought he was God — of all things. I want you who read this to know that Jim was the most honest, loving, caring concerned person whom I ever met and knew.....His love for humans was insurmountable and it was many of those whom he put his love and trust in that left him and spit in his face....."
"The larger question that we should ask," claimed Moore, in that beguiling pitch she uses so effectively on an unaware audience, "is what would have happened if relatives or the media hadn't pressured the community? If they had tried different means, would they have succeeded, and would 900 people be alive today?" THAT is the "larger question"?? Okay, then. It appears the issue of accountability is at last solved. We'll all remember that on tomorrow's anniversary of when a captive group of men, women, children, and babies were annihilated by a Frankenstein in sunglasses. With a little help from his friends, of course. Tomorrow, Tuesday, November 18, tune into the online WCBM (Baltimore) radio broadcast of "The Les Kinsolving Show", 9 p.m. to 11 p.m. (Eastern Standard Time). Les will be joined by both myself and sister Kathleen, as we continue our fight to get the WHOLE story told about Jim Jones and The People's Temple. Join us and call in with your comments! Talk to you soon. MSNBC's Jonestown "Witness" Documentary Verdict: PERJURY. And Tonight-- More Of The Same From CNN? Move over Stanley Nelson. You've got company. Moore and her ilk have reduced the label for these destructive, con-games-on-a-massive-scale to the word 'cult' and have then dismissed the word. As a religious scholar, she needs to know that putting cults and the worship of God on the same plane diminishes religion. Period." An unquestionably cogent observation, Dave. Bravo. Unfortunately, however, for a flaming cult apologist like our "religious scholar" Moore, it's next to impossible for her to feel ashamed until she changes her shameless ways. 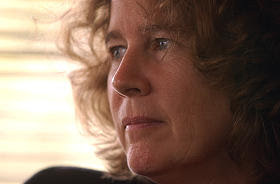 Becky Moore and husband "Mac" McGehee's San Diego-based "Jonestown Institute" offers up an endless dunghill range of cult apologist propaganda, to any and all gullible individuals, with extra heavy shovel loads for knuckle headed producers, directors, editors, and reporters. To make it truly palatable, Mac & Becky market their message with an insidious concoction of fact & fantasy that works the public like some macabre supermarket tabloid. They're willing, able, and ecstatic dispensing all the data, just as long as it's spiked with compelling "evidence" promoting all the wonderful, cheery facets of this so-very destructive cult. And the Moore/McGehee dynamic duo knows exactly how to play such corporate media outfits like MSNBC, so that a nice, sturdy apologist undercurrent will run in the script just enough to chalk up another "mission accomplished." And so it was with "Witness To Jonestown." One after another of Becky's friends testified to the "bad" as well as the "good" of the Jones Cult. Interesting, though, because Producer Stephen Stept seemed to have not cared less about interviewing a very relevant source named Pat Lynch. 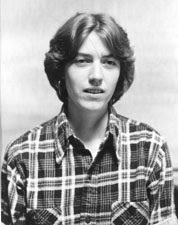 Pat Lynch is a former NBC (as in the corporate chunk that completes MSNBC) Nightly News producer who had prepared a series of reports on the increasingly dangerous People's Temple cult in the months preceding November, 1978. The real story has yet to be told and must be told for at least three reasons. First, there's the matter of accountability for 918 needless deaths. Second, there's the issue of journalistic responsibility. Those who made these fateful decisions at NBC, including former company president Fred Silverman, former NBC News president Les Crystal and NBC lawyers, are still alive. Finally, at a time when the media is criticized for missing the truth about weapons of mass destruction in Iraq and for its own lack of transparency, telling this story is not only a way to come clean but a cautionary tale for all news organizations." Come clean, indeed. Not a hopeful scenario as long as media moguls like Fred Silverman continue keeping it all swept under their very dirty little rug. I am a family friend of the Moore's (Rebecca and Mac McGehee). 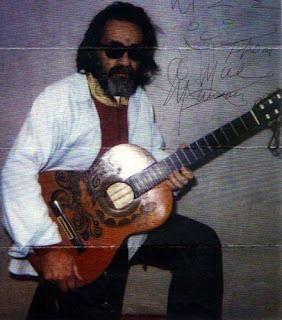 I've written many articles on the website and I've invited your father to write an article for the Alternative Considerations of Jonestown website. Trust me, they have NOTHING against you or your father. Recently at our annual gathering in San Diego, I suggested we solicit Les to write an article of his experience....."
Well, Roger, please don't think me ungrateful, but this side of the fence will have to take a rain check. One of the more obvious sticking points is the fact that Rebecca's father, Rev. John Moore, delivered--quite cunningly--the contents of my father's briefcase (containing Temple exposes) to Jim Jones himself in 1975. This was to be my father's last-ditch effort to stop the cult--two entire years before Marshall Kilduff rose from his lazy, negligent duff to finally do his job responsibly. Rebecca, meanwhile, has lied outright about why my father left the San Francisco Examiner, in her apologist magnus opus, "A Sympathetic History of Jonestown: The Moore Family Involvement of People's Temple." We'll discuss that particular Moore scandal a little later, in all its sordid details. In the meantime, did anyone out there bother taking up my little wager (in the last posting) on the odds that MSNBC would cover up, distort and serve up a generous serving of half-truths, per the "Jonestown Institute's" schematic? Incredibly, there are other apologists like Moore who continue to sing praises for the "bright side" to The Guyana Gulag That Jim Built. 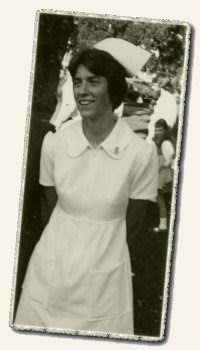 Denise Stephenson, Becky Moore's college roommate, produced the atrocious 2005 book "Dear People: Remembering Jonestown," containing "joyful" letters cult captives frequently were forced to send back to the United States. Some of the letters in particular raved about the "marvelous" food available at Jonestown. Interesting. What a flagrant contrast to then-12 year-old Tracy Parks's (daughter of slain cult defector Patricia Parks) account of the "People's Temple Agricultural Project." "It turned out to be hell on earth," she said. "Once we were there it just finally sunk in and I said, 'Oh my God, I'm going to die here.' We couldn't really get caught talking to each other. Because they knew if you did that you would be planning something." 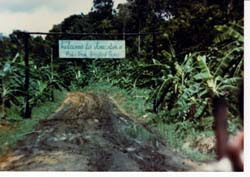 Diaz [her current married name] said that although the community was advertised as a self-sustainable jungle paradise, that couldn't have been further from the truth. "My breakfast consisted of rice and milk with bugs in it," she said. "And I joke today that that's how I got my protein. We were just severely malnourished. We found out later it was the rice they fed to the hogs. They would test you periodically. You had to know Chinese, Russian. You had to teach yourself these things. If they asked you something when you were line for food and you didn't know the answer you'd get turned away. It was a constant fear, exhaustion to keep you from rebelling and keep you more able to brainwash, keep you pretty sedate." Not a chance--that is, if our renowned Cult Apologist Queen and her pals can help it. Rebecca Moore and Massimo Introvigne, on an official 2006 visit to the California headquarters of "Unarius," a flying saucer cult. Introvigne is founder and managing director of CESNUR (Center for Studies on New Religions), as well as a proud director of the Transylvanian Society of Dracula. 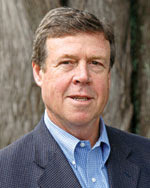 One of Introvigne's more well-known "scholarly papers" was entitled: "'Brainwashing': Career of a Myth in the United States and Europe." NOTE: Tonight, Thursday, November 13 (9 p.m. EST), CNN will debut its own Jonestown anniversary special, "Escape From Jonestown." 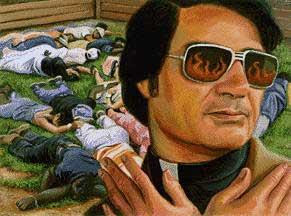 They have disclosed recently the discovery that Jim Jones and his inner circle--including Moore's two sisters, Annie and Carolyn--had been importing cyanide every month into Jonestown, for at least two years before their mass murder of the rest of the cult in 1978. Of course, the real question is whether CNN, like MSNBC, fell prey to the toxic revisionist charms of Mac & Becky's Jonestown Apologist Institute. Stay tuned, one and all. 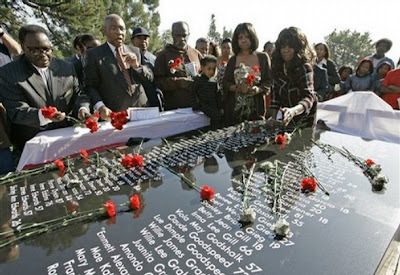 Two Tragic Anniversaries: Will Our Mass Media Still Refuse To Tell The Whole Story? The frightening sensation of this day, again. Just like it clobbered me the first time and has repeated itself, times seven. The view is now obliterated by horror visions of that long, excruciating day. Today, the nation mourns the greatest loss of American civilian life in a non-natural disaster. I wonder, though, about a certain something. Does anyone think our mass media will give even a fraction of this coverage for the other unspeakable slaughter? You know. The one that was the second greatest loss of American civilian life in a non-natural disaster? 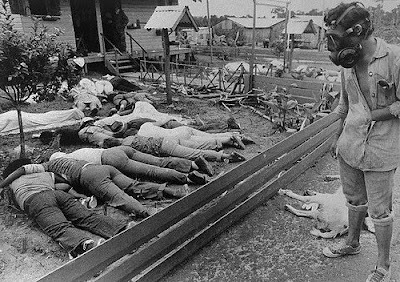 I'm willing to wager that not only will this year's anniversary--the 30th Anniversary--of the Jonestown Massacre get just token attention, but it will be exactly the same wretched slop of half-truths that our distinguished media elites have been serving up since that terrible day, November 18, 1978. The 9/11 disaster, of course, occurred in a completely different context. Indeed it did. The cause, the scope, repercussions. No question about it. 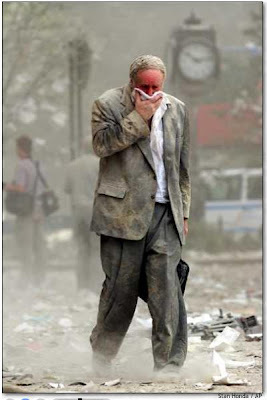 But one thing that shot alarmingly to the surface (our right-wing, loyal Bush Boosters have done like Dubya and just looked away) was that this horrendous tragedy seven years ago today was entirely preventable. What got in way of wiping out Bin Laden's savages before they struck was the most miserable, bumbling, and corrupt president in American history. And the other horrendous tragedy, in Guyana? Oh, the thing that has been purposely anchored beneath the surface is that it also was entirely preventable. It, too, featured a miserable and corrupt politician. Left-wing, unlike Bush, but just as vile. In fact, a whole lot of them. 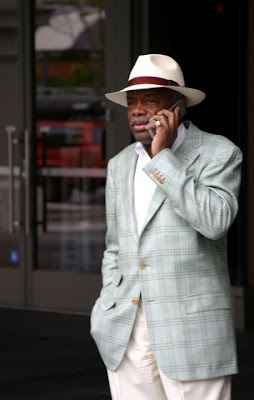 Elected officials, such as former San Francisco Mayor Willie Brown, who came out with his autobiography this year. (Brown's fleeting and self-serving "What did I do?" will leave your breathless.) Others, well, they wore editor outfits and preacher suits. and self-congratulatory praises, if you feel more comfortable thinking that Jim Jones's mass murder of 276 children and over 700 others was completely unavoidable. If you don't, then feel free to return here later. I've got much more to share. 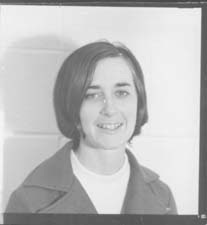 If this woman doesn't look familiar, please send your thank-you notes to our media, and an especially loud applause to Mockumentary Wizard Stanley Nelson, director of "Jonestown: The Life and Death of Peoples Temple." Lord Nelson left her completely out, because his "scripted" little tale wouldn't fly so well if his audience learned about Maxine Harpe, the Temple Cult's first murder victim--in California. Was it just one of those "inconvenient truths", Stan, that compelled you to hide Maxine's story, a woman ruthlessly targeted by Jim Jones years before his Guyana Gulag was even a blueprint?? 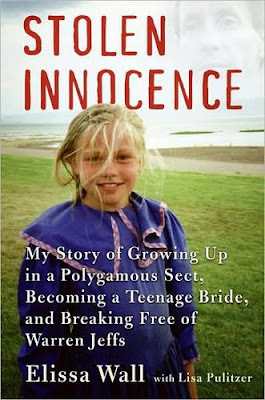 And guess what: She wasn't the only life to be snuffed out during this brutal cult's California years. The rest of the story is on the way. 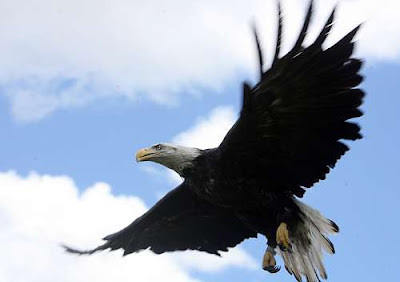 Yesterday, on the eve of our nation's 232nd birthday, they released a now-healthy bald eagle near Lake Tohopekaliga, Florida. The proud national bird had been recuperating for the past two months after an apparent fight with another eagle. Every time I think bald eagle, I recall the story of "Old Abe," the 8th Wisconsin Regiment's mascot during the Civil War that bravely served through 36 battles, including the decisive capture of Vicksburg on our Independence Day in 1863. The daring "Old Abe" managed to survive the war, despite being repeatedly fired upon by indignant rebel forces. But of course several hundred thousand Americans weren't so lucky. And they were the ones that magnificent bird's namesake called in his Gettysburg Address "these honored dead" that "we take increased devotion to that cause for which they gave the last full measure of devotion--that we here highly resolve that these dead shall not have died in vain--that this nation, under God, shall have a new birth of freedom..."
Freedom. So often such a relative term, depending upon where you might find yourself, and to what authority you're forced to answer to. Of course, Abraham Lincoln had a decidedly ruthless scorch earth policy when it came to winning the peace for that new birth of freedom, e.g., blocking all medical supplies to the Southern people, locking up anyone he wanted without trial, etc. Still, I strongly doubt he would have approved of the totalitarian tactics practiced by well-known cultists in peace time, past or present. 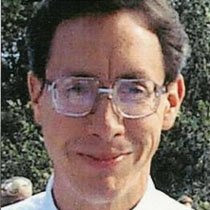 The most recent news item was the lamentable court decision to return the children to the Fundamentalist Latter Day Saints (FLDS) Texas prison farm. Yes, separating children from their mothers can never be easy, yet what is far more agonizing is knowing these children are captives in a horrendously oppressive cult. 1. Forbidden members to use television sets, VCRs, video games or to have connections to the Internet. 2. Banned boating, fishing and other water activities. 3. Instructed parents to throw away most children's books including the Bible. 4. Terminated community and holiday celebrations, such as observing the birthdays of previous leaders and Pioneer Day. 5. Stopped dances, socials, and other get-togethers. 6. Warned members that laughter causes the spirit of God to leak from their bodies. He based this belief on an obscure statement by Joseph Smith. 7. Expelled many men and reassigned their wives and children to other men. 8. Expelled large numbers of teenage boys from his areas of control in order to artificially increase the ratio of females to males. Only by discharging young males does polygamy become possible. Tyrannical. Absolutist. Outrageous. And, still, the children were shipped right back into the jaws of the beast. The "specs" on this particular machine, yeah, might differ from other cult mental meat grinders. Nevertheless, it has all the efficiency of other past and present models. 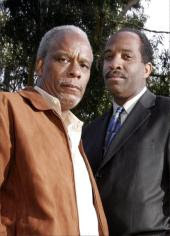 "Prophet" Jones: "Now if you just had had friends like Herb Caine, John Moore, and Willie Brown, you might be sittin' in the Dallas Housing Authority Chair, Warren--instead of a prison cell!" "Prophet" Jeffs: "....Hey, don't forget Tim Stoen, Jimmy!"